WordPress is a Content Management System (CMS) and the most popular blogging platform in the world. The most important thing that makes WordPress so popular is its simplicity and its huge community base of both users and developers. There are tons of free themes and plugins available for WordPress on the Internet. An important feature of WordPress CMS is its comment system. Comments allow users to communicate with the bloggers and they can post their queries or appreciation for the post by submitting comments on the blog. WordPress comments are enabled by default for both pages and posts. There are times when you don’t need WordPress comment system and the comment form. There is an option under Settings->Discussion in your WordPress Dashboard where you can disable the WordPress comments for the new articles, but what about the comments that are already posted and the comment form. There are some plugins available on the internet that can used to disable comments and remove the comment form from the pages and posts. Most of the plugins are outdated and do not work as they should. The only solution that can work in this case is the ‘Disable Comments’ plugin for WordPress. Using this plugin you can globally disable comments on any post type (posts, pages, attachments, etc.). 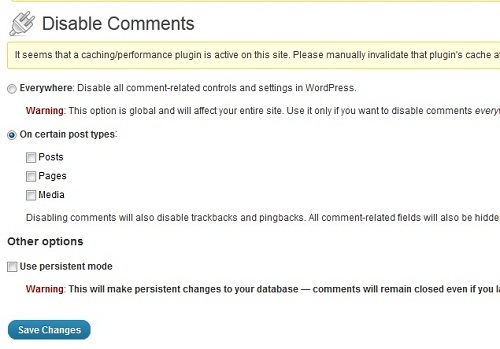 You can also disable the comments on the whole site using this plugin. It also removes the Comment Form from the posts / pages and comment related fields from edit and quick-edit screens. The plugin is very easy to install, just upload it on your /wp-content/plugins/ directory and Activate the Plugin. After that the plugin can be accessed from Settings menu in your Admin Dashboard. The Plugin is actively maintained and updated by its developer. Here you can disable comments for Pages, Posts, Media and for the Whole Site. Leave the persistent mode option unchecked. This is the most easy and safest way in removing comments and all its occurrences from WordPress.